With Unpakt, customers can compare moving quotes side by side and select a mover that best suits their needs. Moving quotes are based on a single formula for all member companies, resulting in a guaranteed and exact price. 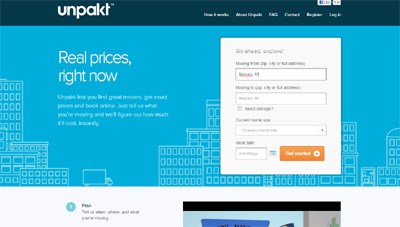 From reviews and resources to instant pricing and online booking, Unpakt makes moving easy. Before Unpakt, customers had to research multiple moving companies, call them, and provide each one their furniture list. Each moving company would then use unique estimation methods resulting in widely different quotes.